The BucksBack Visa Card earns 2 points per dollar spent, with points redeemable in 2,500 increments for $25. You can elect to have your rebate credited as either a statement credit, an ACH deposit to any checking or savings account, or as a check sent to you by mail. Points expire in 3 years from when they are earned. 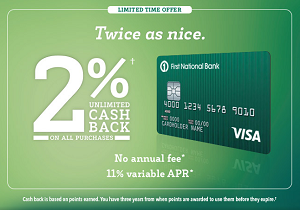 If you do live in one of the eligible states, this is a pretty nice deal, as general purpose 2% cash back cards aren’t very common. The 11% APR, while reasonably attractive, isn’t a real selling point, as if you were looking to carry a balance, there are lower interest options available. Overall, though, the card serves as a viable alternative to the Citi Double Cash card and would serve as similar role as a nice general purpose 2% card. Given the low advertised APR, however, it’s likely that the BucksBacks card has slightly more stringent underwriting standards than the Double Cash card. Another thing to note is that the BucksBack card is a Visa card, while the Double Cash card is a MasterCard, so that’s a potential benefit for those looking to diversify their card collection. For more info on the BucksBack Visa Card or to apply, see this link.